According to Fr. Karl Rahner, hell would be the center of an evolving universe. For him, the Catholic doctrine teaching that hell is a place for moral punishment is nothing but a primitive presentation of a higher reality, which he tries to explain in his book The Christian and Death. 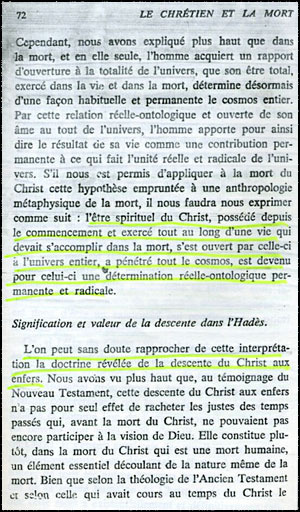 Hence, when the Church teaches us that Jesus Christ descended into hell, what actually happenned, according to Rahner, is that Christ, like everyone else who dies, was re-inserted into the life force of the evolving cosmos. This actual insertion of Christ into the energy of the cosmos enriched the whole evolutionary process and, therefore, also the lives of those who are still living. 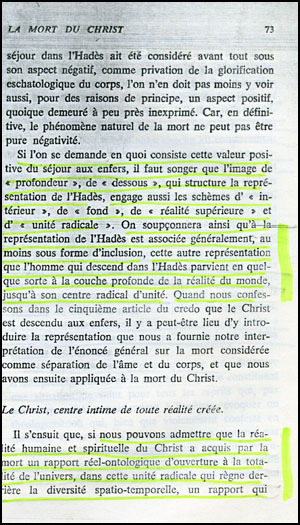 This is what Rahner affirms using technical-philosophical language. The spiritual being of Christ ... opened itself through death to the entire universe, penetrated the whole cosmos, and became a permanent and radical real-onthologic factor in it. Since the soul is linked to the material universe in a substantial way that touches the depths of reality, the universe conditions this relation insofar as this dimension is no longer in our space, but belongs to the [different] time souls have in function of their substantial unity with the universe. So, this relation, far from disappearing in death, becomes a relation of openess. 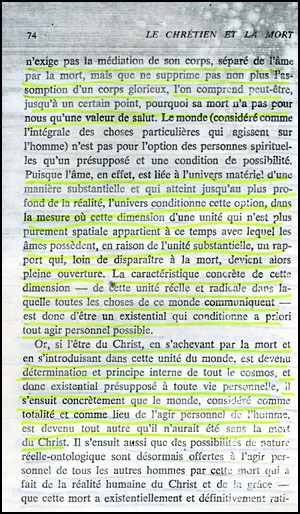 The concrete characteristic of this dimension - of this real and radical unity within which everything in the universe commnicates - is, therefore, to be a factor that conditions a priori every possible personal action. Now then, if the being of Christ, who fulfilled himself through death and introduced himself into this unity of the universe, became a determinant factor and internal principle of the cosmos - and therefore, a necessary factor in every personal action - it follows that the world as a whole and as a place of personal action became different than it was before the death of Christ.